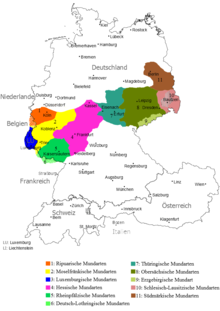 Hessian (German: Hessisch) is a West Central German group of dialects of the German language in the central German state of Hesse. The dialect most similar to Hessian is Palatinate German (Ger. : Pfälzisch, pronounced [ˈp͡fɛlt͡sɪʃ]) of the Rhine Franconian sub-family. However, the Hessian dialects have some features which set them somewhat apart from other West-Central German dialects. To understand this division, one must consider the history of Hesse and the fact that this state is the result of an administrative reform. The urban regiolect of Frankfurt and the Rhine-Main area is based on the Southern Hesse dialect. In the Central Hessian dialect area, the Frankfurt regiolect is gradually replacing the traditional local dialects. Consonants are often softened, as outlined by Carsten Keil in his document "A Quick Guide to the Language of Frankfurt". For instance the German "Äpfel" (apples) becomes "Ebbel" in Hessian. ^ Hammarström, Harald; Forkel, Robert; Haspelmath, Martin, eds. (2017). "Hessian". Glottolog 3.0. Jena, Germany: Max Planck Institute for the Science of Human History.